Mesdames et messieurs, Ladies & Gentlemen, Meine Damen und Herren, let me introduce the subject, the technological jewel, of electronic engineering, which will definitely get you rid of your CRT screen. Yes, I know, some old-school gamers might say it's a sacrilege, others talk about enchantment and possessions, but you read it right: THERE IS A QUALITY ALTERNATIVE TO CRT SCREENS TO PLAY RETRO-GAMING SYSTEMS! Moreover, let's behave as chauvinists, let's go further still: the XRGB-3 is a better alternative than a good CRT to play retro consoles, particularly the Neo Geo, since it's all about this machine here. If our old CRT provided an excellent picture, close to perfection, I'm not afraid to say here that with the XRGB-3 and some other accessories, including a good plasma screen, we can reach perfection. No geometry problems, perfect contrast, off image, inclinations, distortions depending on the intensity of displayed image: flat HD TV provides stability and perfect geometry, which was conceptually almost impossible with a CRT. Certainly, very fine adjustments allowed to tickle perfection. With our new generation screens, the image is upright, stable and geometry unchanging. About proportions, given that we use a 4:3 image on a 16:9 screen, know that the diagonal rendered on a screen of 127cm is just over 100cm and about 85cm on a 107cm screen. But as you can imagine, achieve this will not be without pain (otherwise everyone would play like that) as much for your wallet, as well for your headaches. Get the essence of your infernal trio made of your plasma screen, your Neo Geo and your XRGB-3 is quite complicated. 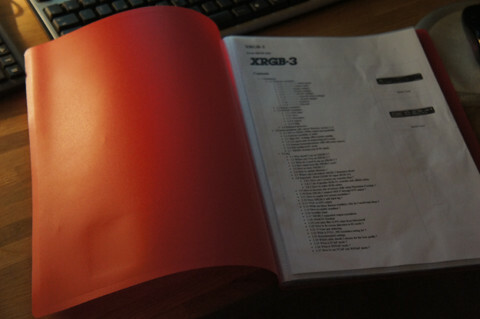 If you're ready to embark on the adventure, start by consulting the XRGB3 WIKI, and print the twenty pages available: now you have a homemade manual for your favorite upscaler. It will also take some gear, a good soldering iron and a holy patience. But it's your lucky day, you came to Neo Geo Kult, and we'll give you a hand. Here's your homemade manual, which will be very useful! First, detail EVERYTHING you need for a successful install, and calculate the budget together. We will not consider the Neo Geo and your TV, assuming you already have these two objects. For the screen, Plasma will better case than LCD or a LED: The response times are better and the framerate never look any worse. The display will also look better, but do not worry if you have an LCD screen: the installation as we will achieve a minimum of lag and the display will be perfect on a recent screen. On the Neo Geo, I refer the reader to the article on the quality of the image on the console and in particular the chapter on serial numbers and quality RGB: since we will use this format here all have that there are better. Allow up to 450 euros for all the new equipment, the upscaler by itself already cost an average amount of 400 euros with shipping included. The 110/220 adapter is required to have the XRGB working (Japanese format). 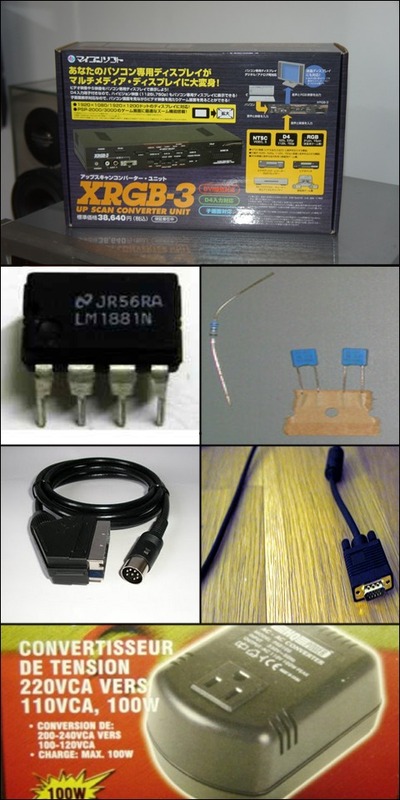 The 21-Pin Japanese RGB Cable is also essential, remember that you must never connect the Euro SCART cable on XRGB-3, as this could adversely damage the system. We choose the VGA rather than DVI, simply because DVI does not authorize the use of B1 mode . B1 mode allows adding scanlines and reduces lag ... no need to dwell! Shielded VGA cable is required to have the least possible noise in the signal, and finally the LM1881 with two condos and resistances are the icing on the cake: thanks to them, no more unstability problems with image... Further explanations in the next chapter!